For a boat of only five metres the Robelo R160 centre console is equipped with exceptional completeness. Every part of the internal space is well and cleverly used, but there is no suggestion of crowding: this is a roomy centre console. That said the R160 is available with an extensive range of options including full bow rails, pot winch and tipper, ski towage, T-top or Bimini. The review boat had optional tilt steering, side rod racks and a folding windscreen. The aim is to suit the boat to whatever the owner has in mind. Anything the builders cannot supply will be provided by dealers Mansfield Marine who are also shipwrights. What comes in spades as standard is abundant insulated stowage. The reversible main double seat is mounted on a large demountable icebox. Under the bow platform is a catch tank that can double as another icebox. Ahead of the console the upholstered seat lifts to reveal the plumbed live tank. A nice touch is a sextet of rod sockets surrounding it. Both portable and built-in fuel tanks have their adherents; the R160 should satisfy both camps. Mid transom a lifted lid reveals a 68 litre tank bolted into place but readily removable. Periodic total draining and cleaning – never a bad idea – is an easy task. Flanking the tank is a pair of unusually comfortable folding quarter seats. The hull, a very recent design, has a lot special about it. Its structure features Kevlar reinforcement, no doubt contributing to the ten-year hull warranty. The medium 15 degree deadrise is enhanced by the ‘Hydrolift’ multi angle bottom with extended V-plane. This really does seem to influence hull behavior. 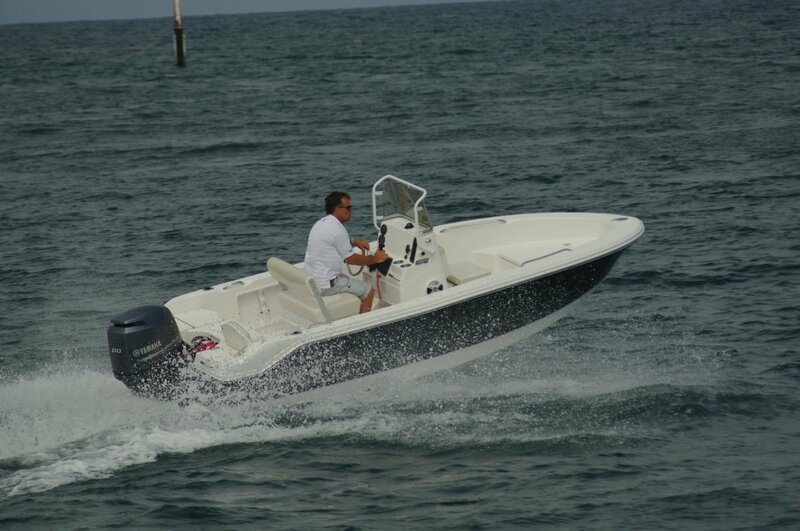 On the review day, admittedly mild, full speed over the available rough stuff gave a soft ride with almost deathly hull silence. The visible bits of hull are constructed from just two moulds, giving a rigid and clean structure. This also delivers level flotation when flooded. Not a safety feature, but unusual and welcome in a fibreglass boat is a choice of hull colours. A centre console is the definitive fishing boat, but the R160 offers a much wider range of uses. Certainly it is well geared to the angler and his mates, but it also lends itself to Rottnest tender work. RIBs, with their soft, fibreglass-kindly hulls, have most of this market, but the R160 would appeal to an owner who worries about wear and tear on the tender itself. Pot hauling and the landing of significant sized fish can call for more care than the owner might get from friends keener on action than on the preservation of buoyant tubes. Dive tender is another potential task. The necessary elbow room is here, easy water entry and a decent ladder. Crabbing at Mandurah seems a natural too and, with decent power, so does skiing. The recommended power range is from 60 to 90 horsepower, and the bottom end should do the trick seeing that the 80hp Yamaha installed delivered 40 knots in jig time. For non skiers sea biscuits provide an effortless equivalent excitement. Whatever the activity good stability is welcome, especially on a centre console, a layout that encourages people movement. The R160 is above average here. The windscreen is mounted in a frame with ample strength to be a standing passenger’s handhold. Folding it lowers the R160’s height on the trailer to less than six metres. Besides reducing wind drag when being towed this allows parking in tight spaces. On the subject of trailers, the R160 is imported naked. It is then fitted with an Australian-built trailer, removing the chance of difficulties registering one from the USA.